Antequera gastronomy, Malaga food and drinks. - Cut the bread into small pieces. - Boil the tomatoes in water for 5 minutes and peel them. Then move the tomatoes to a bowl with cold water. - Put sliced garlic and the rest of ingredients in a bowl, mash together until it holds together as you add olive oil gradually. - Cold down in the refrigerator and serve it. 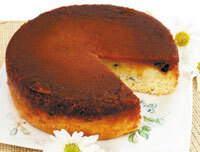 - Prepare the sponge cake with a fine layer of cider jam. - Make a syrup with the sugar. - Make a mass with 3 full eggs, 9 egg yolks and the beaten almonds. - Mix both the syrup and the mass and put them into the fire for 2 minutes. - Extend the mass on the sponge cake. - Cover the result with ground cinnamon and let it rest for 1 day. Address: Avenida del Comandante García Morato, 34, 29004 Málaga, Spain. Tel: +34 952 17 60 30. Email: info@malagacar.com. All content © 2019 malagacar.com - Bardon y Rufo 67 S.L.